I really like all the smalls patterns they have in their latest books! This one is again on mystery fabric (36 ct) - I have a drawer full of mystery fabric - and I used VC silks. 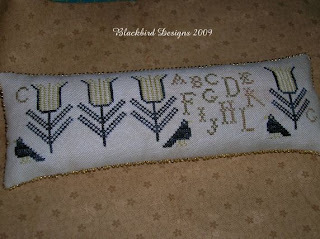 I really do have several things started that aren't Blackbird Designs...but then again I have several other Blackbird Designs started too. 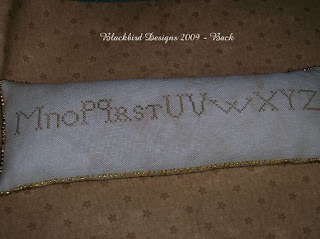 I am working on a small picture for my granddaughter's room that is Country Cottage Needlework - Princess Parade. Beautiful pillow - great fabric/floss choice! Love that fabric! Congrats on a wonderful finish!! !